On a golden autumn afternoon two years ago, Lightcliffe CC lifted the Sovereign Healthcare Bradford Cricket League Priestley Cup for the first time in over 40 years. This Sunday (noon start at and against Bradford and Bingley) they aim to the win the coveted trophy for the second time in three seasons. The club’s public relations chief and 2nd XI captain Michael Brooke says: “In many ways, reaching the final this time is a better achievement. “On a smaller budget, with only two paid players and a professional, captain Alex Stead has galvanised a team of solid league players. After a first-round bye, Saltaire were easily despatched in the second round. The quarter-final saw Cleckheaton visit Wakefield Road. A fired-up Rob Burton was the hero, battling away in the drizzle and gloom, before hitting a towering six to seal a last-over victory. This week an emotional Stead was contemplating the big day. A final practice session was being held, before a team meeting Saturday night and an early morning breakfast on Sunday en-route to Wagon Lane. Stead said: “What a journey it’s been. Who would have thought it? It’s been a really enjoyable cup run, giving us a welcome distraction from the league. “And, we’ve seen off some of the big boys. Our match-winning players have put in some match-winning performances. “Our overseas player, Sully Khan, can destroy any attack on his day. Rob Burton has a cup final pedigree to match any Bradford League player. I don’t think he’s ever lost a final. He will have a big part to play in the team-talk”. Stead also has other experienced players to utilise. He added: “Chris Greenwood is a big player in every sense. “His bowling is an asset to any captain. Jockey Wilson has darted into form just in time, and Rhys Jowett should never be ruled out of the equation. “Mark Horne is a scrapper behind the stumps, feeding off every half-chance and providing useful late-order runs. Jonny Whiteoak has been a good addition to the ranks. His sharp bowling will be useful on the pacy Bingley wicket. In addition, Stead has been the batting glue. With over 600 runs at an average of 45, if he fires the side normally wins. This well-balanced team are on the verge of a famous win. 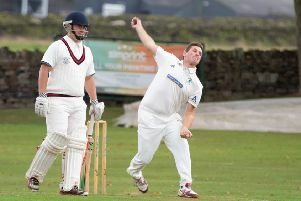 Meanwhile, Lightcliffe Thirds in their latest Halifax Sunday League Division One match, were frustrated after tea as a torrential downpour scuppered their chances to capitalise on a strong bowling performance against SBCI. Choosing to bowl on a pitch that gave both seamers, swing and spin opportunity, Lightcliffe dominated from the first over, with wickets for Matthew Sumpner (2-22), Shoaib Hassan and Alex Kennedy (3-27) left relegation-threatened SBCI in trouble. All was in vain however as a rainstorm after only 11 deliveries of the Lightcliffe innings put paid to any prospect of completing the match.